Leipzig is one of the largest cities in the state of Germany. The city has a rich cultural heritage and is an important tourist destination. Leipzig is a major city of Saxony, located in east central Germany (German: Deutschlandkarte). It lies at a distance of 150 kms from Berlin. The city covers an area of 297.6 sq km and had a population of 520,838 in 2012. The origin of the town can be traced to a small fortified town of the 11th century called the Urbs Libzi. The mention of this name is found in 1015 in the accounts of Bishop Thietmar of Merseburg. Since 1165, the town grew in economic importance. A number of monasteries were located around the town. In 1170, the town was granted municipal status. The city has a rich culture, especially in music and was the main region where Bach worked. It is also the site of the greatest peaceful uprising which toppled the communist government in East Germany. Leipzig is located in Saxony and is the southern part of the north German plain, which is a part of the Great European plain. The city is located at the confluence of the rivers Parthe, Pleisse, and White Elster in the Leipzig Bay. The region is mostly flat and parts of it are covered by swamps and forests. However, prolonged mining activity has gradually destroyed the forest. The city is also located at the cross-section of two old German roads called the Via Regia and the Via Imperii. The city experiences a continental climate with hot summers and cold winters when the temperature frequently falls below freezing. 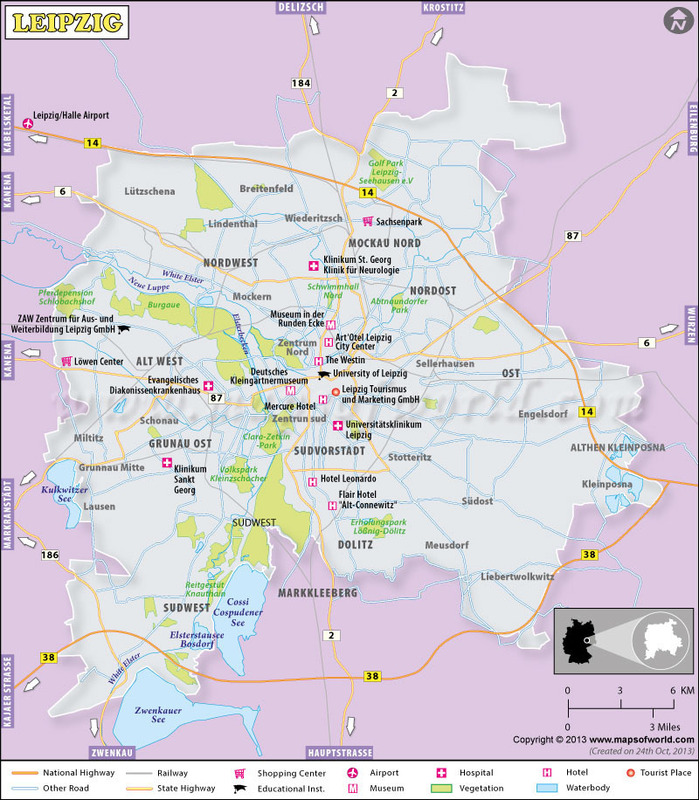 The city is served by the Leipzig or the Halle airport, which is located 22 kms to the northwest of the city center. It is the second largest airport in Eastern Germany and is connected to most European destinations. You can also fly to the Berlin airport or the Frankfurt airport and travel to Leipzig by road. The railway station of Leipzig is the largest in Europe with 26 platforms. The city is connected by train to a number of destinations in Germany and also with Prague via Dresden. Three autobahns, A9, A14, and A38 connect Leipzig to other parts of Germany by road. Summer is the best time to visit Leipzig because the temperature remains at the most comfortable. Though it is the rainy season, this does not hamper tourism because the city does not receive heavy rainfall. The Leipzig carnival held in January is attended by thousands of visitors and it includes a number of parades. The Leipzig Book Fair is a major international event with more than 2,000 participants from all over the world. A number of book-related events are held here. The historic Leipzig Easter fair is held in mid April. An old style street market is set up and traditional foods are offered. Medieval dancing is performed. The Leipzig marathon is one of the oldest sporting events in the city. The National Flower Festival is held from April to October. Flower exhibitions are held in gardens, and concerts and theater performances take place. The Fun Fair with a number of rides and a huge Ferris wheel is held thrice a year. The Music festival in late May is a major cultural event and includes a number of open air concerts. Similarly, the Gewandhausorchester Open Air held in June also includes such concerts. The Bach festival is held in mid June to celebrate the music of Bach. The Christopher Street day is a huge gay parade held in mid July with plenty of music, party, and revelry. The Saxony international balloon fiesta is celebrated in July, when a number of hot air balloons fill up the sky. The water festival held in August includes concerts and theater performed on the water bodies of Leipzig. The Leipzig International Chamber Music Festival in November celebrates classical music of the area. The Nikolaikirche is the largest church of Leipzig and the starting point of the peaceful revolution of October, 1989. The St. Thomas Church and Bach Museum are where Bach worked as cantor and where his remains are buried. The Old Town Hall is a beautiful building with a good collection of medieval art, an altar, paintings, sculpture, and a city history museum. The Museen im Grassi (Grassi Museum) contains a rarity filled exhibition that details the music of five centuries. The Museum at the Round Corner houses the previous Stasi headquarters and shows how the secret police manipulated and controlled people during the Communist regime. You should also visit the houses of the famous composers of the area like Mendelssohn, Schiller and Schumann. The Völkerschlachtdenkmal is a 91-meter tall monument – the highest in Europe which commemorates the battle of Leipzig where Napoleon was defeated by the combined forces of Russia, Prussia, and Austria. When you plan for travel, the first thing that you need to focus on is a great stay option. Thankfully, there are a number of places to stay in Leipzig that would cater to your taste. If budget isn’t a constraint for you, then Fuerstenhof and Steigenberger are some of the 5-star hotels to choose. Besides, you can also choose 4-star ones like the Lindner, Novum, Mercure, Pentahotel, Royal International, Arcona, and Marriott Hotel. For those who want a comfortable stay and are looking for affordable options as well, 3-star hotels including Amadeo, Top Vivaldi, Flair, Adler are available.